How To Install & Lay – Professionally! Making the decision to go artificial with your lawn is the easy part.  The advantages offered by high quality synthetic turf are numerous and amazing. But, there is one thing that can make your high-tech lawn look decidedly shoddy; a bad installation. We’ve all seen what poorly installed fake grass looks like. Weeds busting through and the rolls bunching up at the corners. It is bad installation jobs like this that previously gave artificial grass its bad name. Install your grass properly and you’ll have a wonderful, green and natural-looking lawn that will serve you well for many years. When you are considering the purchase of artificial grass, speak to us about professional installation. We are up front about our costs, there are no hidden fees. You can then make an informed decision about if you would like to have us do it, or if you would like to do it yourself. If you go with the DIY option, read on for our step-by-step guide. The first thing to do it calculate how much grass you need in metres squared (m2). Important: you must include a good few centimetres tolerance in each direction. It is much more preferable to have to trim down to size and have the perfect fit, than come up short and have to make the agonising decision – do I go and buy a little bit more and try patchwork? Or do I bite the bullet and buy a whole new roll? Measure twice, add at least 30cm in each direction, and buy once. Before you order the right amount of grass, consider carefully how you will lay your rolls of turf. You want to have the fewest number of joints possible. This might mean that you lay the turf up & down or side to side. If you have a very unusual shaped area that you wish to cover with grass, you may have to be creative with the angles that you lay at. Unusual shapes often mean a lot more wastage due to the fact that the artificial grass is supplied on a roll and so naturally only gives a square or a rectangles. For example, a 3mx3m square area to cover would be easily covered by a single cut from a 4m roll, however a 3mx6m irregular shape area may take 3 or more cuts from the roll to cover and although it is only twice the area to cover, it may cost more than twice as much to buy the right amount of grass to cover it properly. Our grass is supplied on 2m and 4m wide rolls and extend in length up to 25m. During production an edge of the grass is trimmed. This is always removed during installation and you should not count these few centimetres in your calculations. Order the right amount of artificial grass as well as the other tools and material required – read on to the next section to know what you need and for what purpose. This is part that most DIYers fail on. They buy the most expensive, top of the range artificial grass and lay it like an uneven carpet over weeds and bumps… don’t make this mistake. Prepare properly. Dig out the top soil from the area. Make sure there are no roots or clusters of flower bulbs, or anything that might rot away. As it rots away it can leave a void that may prove unsightly for your lawn in future. Lay sand. Use sharp sand and lay it 30-35mm thick. You need to compact it down well so make sure you have enough sharp sand to cover the area you are working with. Compacting the sand can be done in a number of ways. Smaller area can be done with a plank of wood or the smoother backside of a spade or shovel. Once the sand is compacted you should use a large spirit level to run over the area and ensure everywhere is level and even. Lay Membrane. The membrane stops any seeds from germinating beneath the artificial grass. You must lay the membrane directly below the fake turf and overlap any joints by at least 100mm (10cm). 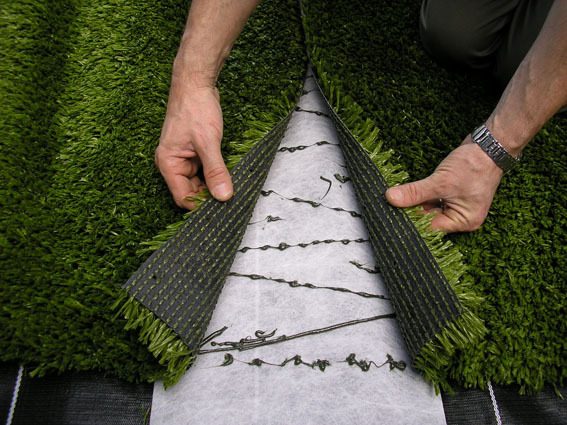 Try to arrange the membrane so its joints, misalign with any joints in the covering turf. When your preparation is done it is time to move to the next stage and get the grass down. 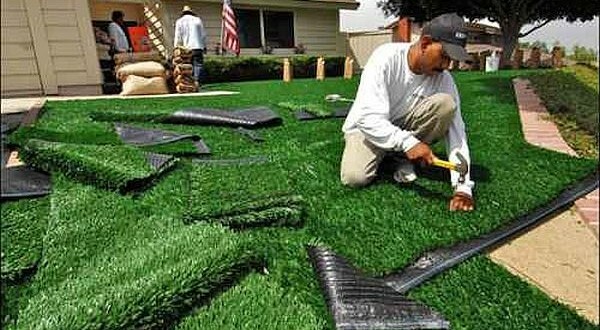 In line with your carefully drawn up plans, lay out your new grass on top of the membrane. Allow the extra bits, the tolerance, to lie over the edges where you will eventually cut to size. Allow the grass to lie there for approximately 24 hours. It may expand or contract a little bit as it settles into its new flat position. Secure the grass in position so it doesn’t blow away or get damaged by over-night winds or by curios pets/children. After you have left your new grass for an adequate amount of time, it is time to fix it all into position. The key word here is careful; be very careful. Firstly address the joints. Make sure they are lined up properly and are looking natural. You need to carefully fold back the two pieces of artificial turf and place backing tape where the join will be. Now you must spread adhesive on the tape taking care not to get any on the blades of grass. Once done, fold the turf back into position and pat down but do not apply too much pressure as the adhesive may squeeze through to the surface and you don’t want that. Cut to size. Using a very sharp knife, such as a good-quality Stanley knife or craft knife, cut your grass to size. If you have a lot of turf to cut, be prepared to change your knife blade regularly as a dull knife will produce an inferior cut. Fix in position. By this stage you should have your artificial turf sitting level on top of well-compacted sand, covering the entire area that you want to cover and joined securely at any joints. There are a few techniques to fix your turf in position. You can use ground pins which you hammer in a regular intervals around the edge. You can have lengths of treated timber (treated to resist rotting) and then tack the turf to it. Or you can have a concrete edge to the area that you can use the adhesive to fix the turf to. There you have it. A handy guide to follow with a few tips thrown in. If you have any questions about the process or need a few words of advice, please do not hesitate to call us. As a valued customer we are always more than willing to help you with anything you need in relation to our products. Our Company is based in the heart of the city. Aberdeen Artificial Grass Company are based in the heart of Aberdeenshire. Our free surveys are available across the city and surrounding areas. Fill in the form below, and get started.